The toy, called Magnetix, is used to construct various shapes by joining magnric parts. It was approved by federal safety commision. 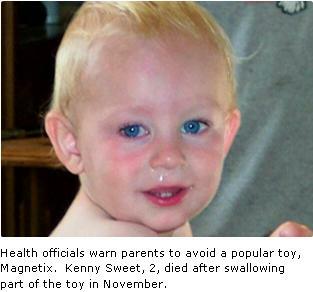 Commion failed to find out that the toy was faulty and the magnet separtes out from the main part. The commission should have analysed in detail and, atleast would have recalled the toy, children cant be given life threatning toys. The boy swallowed two magnets that pinched his small instentine and released bacteria in blood, some other chidren were saved after surgery.